The connected-car automotive MCU (micro-controller) from STMicroelectronics (ST) enables secure remote updates and in-vehicle networking. It provides 16 CAN FD and 24 LIN interfaces besides others. With security and on-chip code storage, ST's latest Chorus automotive micro-controller is capable of handling major OTA (over-the-air) updates securely. 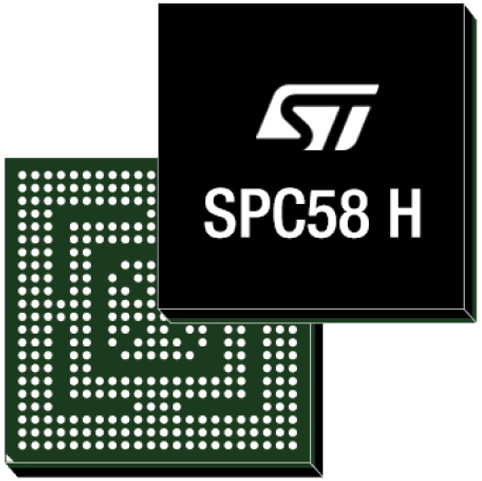 With three processor cores, more than 1,2 Mbit/s RAM and on-chip peripherals, ST's SPC58 H Line joins the Chorus series of automotive MCUs and can run multiple applications concurrently. 16 CAN FD interfaces as well as 24 LIN interfaces are featured. Chorus can act as a gateway for multiple electronic control units. "The way carmakers create, configure, deploy, and maintain new vehicles is changing, as software-defined functionality makes advanced features, flexibility, and convenience ever more widely accessible," said Luca Rodeschini, Automotive and Discrete Product Group Strategy and Micro-controller Business Unit Director, STMicroelectronics. "Our latest and highest-performing Chorus micro-controller, being OTA-ready and with dual Ethernet ports up to Gigabit speeds, creates a state-of-the-art platform for seamless, safe, and secure in-car connectivity and control." To protect connected-car functionalities and allow OTA updates to be applied safely, the Chorus chip contains a Hardware Security Module capable of asymmetric cryptography. Being Evita Full compliant, it implements attack prevention, detection, and containment techniques. Leading customers got already samples of SPC58 Chorus H Line micro-controllers in the next generation of gateways and central body modules, and are also evaluating the devices for battery-management units and ADAS safety controllers, said the company.